Just like their earlier cars, Rolls-Royce promises nothing short of the best in terms of quality, design and driving experience. Rolls-Royce has always been known for motor cars that are truly a class apart. Whether it is the design or the technical detailing, a Rolls-Royce product is unique as well as exquisite. Keeping up with this tradition, the brand has now launched its Bespoke Waterspeed Collection. Featuring 35 Drophead Coupes, this limited edition collection takes inspiration from Sir Malcolm Campbell's iconic Bluebird Waterspeed boat. 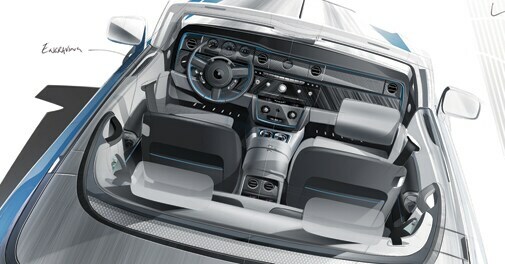 Special attention has been paid to keep the cars nothing short of exemplary, and the sketch above displays the details. The brushed steel exterior, along with an exclusively developed maggiore blue colour scheme and hand-crafted wood inlays, gives the owner the feel and experience of a boat effortlessly gliding through water at a formidable pace. Just like their earlier cars, Rolls-Royce promises nothing short of the best in terms of quality, design and driving experience.